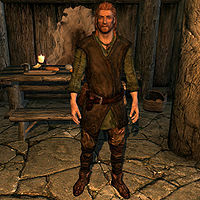 Erik is a Nord barbarian living in Rorikstead. He is the son of Mralki, innkeeper of the town's Frostfruit Inn, while his mother died when he was little. Erik is bored of his life as a farmer and yearns to go outside the town and taste adventure. However Mralki, a caring and overprotective father, won't let his son do anything even remotely dangerous. Erik asks you to convince his father to change his mind. He will change his name to Erik the Slayer. After completing his quest it is possible to hire Erik the Slayer for 500 gold when returning at a later date. Erik is a melee/bow class that favors two-handed weapons and light armor (he has semi-decent Block skill). He has a cheerful disposition and comments about how little regret he has about becoming an adventurer. He can also be recruited into the Blades. He sleeps from 10pm to 6am, waking up to head outside and tend the crops. He ends his workday at 6pm and returns to Frostfruit Inn for a one-hour evening meal. He then spends the rest of the day inside the inn until his bedtime. When he becomes a mercenary, however, he will quit his job as a farmer and instead will just stay at the inn. He wears a set of farm clothes and boots, and wields an iron sword. He carries a spare belted tunic and a selection of middle-class items and gold. As a mercenary, he will be clad in a more appropriate apparel: a set of iron armor, gauntlets, boots, and a shield. He will keep his iron sword, but will discard his other items. When you approach him, he may tell you about his father: "My father, Mralki, manages the inn. He used to be a soldier, but he left that life behind." If you have not solved his problem, he may also remark, "You look like you've seen your share of adventure. I envy you that. In fact, maybe you can help me with something." Similarly, if you have refused to help him earlier, talking to him again will have him ask you, "Did you reconsider? Will you talk to my father?" You may mention that his crops seem to be thriving, and Erik will agree, "It's true. For as long as I can remember our crops have always done well. I'm not sure whether it's the soil, the climate or the favor of the Divines, but we've never had a poor harvest." When asked if he has lived here all his life, he will reply, "Born and raised right here in Rorikstead. My father was a soldier. He fought in the great war and when it was over, he retired here to raise a family. My mother passed away when I was just a babe, so he did his best to raise me on his own. It's not the most exciting place in the world, but the people here work hard and don't cause trouble for anyone." If you ask him what is it that he needs. He will reply, "I want to be an adventurer like you, but my father says I can't. He says that he needs me to stay here and work the farm, and even if he did let me be an adventurer, we couldn't afford to buy armor. His name's Mralki, and he's the innkeeper here. I hope you can change his mind." You can tell him that you'll see what you can do, and he'll be grateful: "Thank you. I can't stand the thought of being trapped in this village for the rest of my days." Alternatively, say that he should probably stick to farming and Erik will reply, "Well, if you change your mind, I'd still like your help." If you have accepted to help him, he may tell you, "I hope you can change my father's mind. He can be a little stubborn." as you bid farewell with him. You can see that Mralki insists on protecting Erik, as he can be found saying, "That fool son of mine, Erik, wants to be an adventurer. He [sic] a good-natured lad, but he's got no idea how dangerous the world really is." and "Some folk here will tell you I'm sheltering my boy too much, but I ask you, isn't it a father's duty to keep his children safe?" Talk to him about his son, and he will again show concern: "My son? Erik? What about him? Did something happen? Is he alright?" When you tell him that Erik wants to be an adventurer, Mralki will reason that he does not have enough septims to buy his son some armor. To solve this, you can either bribe, persuade, or intimidate him. When you return to Erik, he may ask you, "Did you have any luck talking to my father?" Telling him that you haven't spoken to Mralki yet will have him comment, "Can't blame you for having better things to do than help some farmer you don't know." Should you say that his father changed his mind, Erik will be overjoyed: "I can't thank you enough, friend. I'll hope you'll come back to Rorikstead soon and pay me a visit. Maybe we can swap stories about our adventures over a mug of ale at the inn!" After some time, visit Rorikstead and Erik will don his new set of armor and adopt a new schedule. His dialogue will also change: you cannot ask him about his life in Rorikstead anymore. He will greet you, "Good to see you again! How would you like to hire a brave, if untested, mercenary?" He may comment on his new life: "It just feels right somehow, having this new life as an adventurer. It's what I was meant to do. ", "At first I thought I'd miss farming. I guess I've had my fill of it, because I don't miss it at all. ", and "This new armor fits me like a glove." He may also tell you about his plans for the future: "If I can make enough money here in Skyrim, I think I'll travel to Hammerfell and see what work I can get there." If you have hired him, he may also say, "You're back! Great! Are we going on another adventure?" or "It's great to see you again! It's been too quiet without you around." You may comment on how his name sounds fearsome, and Erik will explain, "Father says I should pick a name that describes what I really am, but nobody's going to hire Erik Greenthumb or Erik Hoe-pusher. No, I need a name that will put some fear in the hearts of my enemies. When I have some enemies, that is." If asked, he will also explain why he decided to become a mercenary: "Seemed like the best way to see the world and make some coin. Sure I'm a little green, but what I lack in experience, I make up for in courage." Upon hiring him, he will enthusiastically say, "Lead the way!" When you say that you need him to do something, he will ask, "What do you need?" Tell him to wait and he will reply, "I'll be right here. Be careful now!" When you ask him to follow you again, Erik will exclaim, "Great! Let's go!" If asked to trade items, he will say, "No problem! How can I help?" Dismissing him will have him tell you, "Well, it's been fun. I guess I'll head back to Rorikstead." If you have hired Erik the Slayer before, approach him and he will tell you, "I could really use some more experience in the field. I'd be happy to join you again, and it won't cost a thing." Accepting his offer will have him say, "I'm ready to go!" Erik the Slayer: Help Erik become an adventurer. Jouane: "Anything I can pick up for you on my next trip into the city, Erik?" Erik: "Thanks for the offer, Jouane, but I'm saving up for a new sword." Erik: "I'm not saying it's my business, but I have to ask. Why are you so cruel to your little girls?" Lemkil: "You're right, it's none of your business. How about you keep your nose out of it?" Erik: "You keep on like you are, you'll end up with two daughters who hate you." Lemkil: "Hah! And what would a witless oaf like you know about raising children?" Rorik: "Ah, there's nothing like fresh air and honest labor to bolster the spirit." Erik: "True enough, but there's nothing wrong with a little adventure now and then. Not much excitement in working the soil every day." Erik: "Father, how old were you when you left home?" Mralki: "I know where this is going, son. As I've said many a time. the world is a dangerous place. You're much safer here at the farm, with me." Erik: "But I don't want to be safe! I'm not afraid of the dangers out there. The only thing I'm afraid of is wasting my life on this farm." Mralki: "Yes, that's your mother's side of the family talking. Just stay on for one more season, that's all I ask." Mralki: "I heard you sneaking around downstairs last night. Were you trying to break into my chest again, son? I've told you to leave it alone." Erik: "I just wanted to try on your old armor, from back when you were a soldier. I thought I might be old enough to wear it." Mralki: "I've told you a hundred times, I lock that chest for a reason. I don't want you getting a head full of ideas about adventure and glory." Erik: "I'm old enough to decide how to live my life, and I'd be honored to wear your armor, if you'd just let me. I'm strong enough to handle it." Mralki: "Strong, yes, but how clever are you? I'll tell you what, if you can open the lock on my chest, you can have everything in it." Erik: "I'll take your challenge, but if I win I get to start a new life as an adventurer, and with no objections from you." He is based on Erik West, who was known as "Immok the Slayer" on the forums and who died of cancer in May 2011. Before changing his name to Erik the Slayer, his RefID is 000350B8 and his BaseID is 000350A7. He should put on his new armor immediately after your fast travel away and back. If that doesn't happen, try entering setstage RoriksteadFreeform 20 and talking to Erik again. Then move away and come back. Although his default gear is governed by the Heavy Armor skill, Erik is actually more proficient in Light Armor. Additionally, he is by default equipped with a one-handed weapon and shield, though he is more proficient in Two-Handed. This issue has been addressed by version 2.0.4 of the Unofficial Skyrim Patch; his class was changed to CombatWarrior1H. He has unused lines for when you tell him to wait ("You sure? All right. I'll keep guard here.") and when you tell him to follow you ("Good. I'm ready for anything. "), but due to a scripting oversight, you cannot normally hear it. Erik may occasionally be found beside the road close to Gjukar's Monument for unknown reasons. 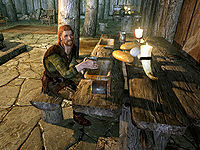 Hiring and dismissing Erik on these occasions will cause him to return to Rorikstead. When accompanying you as a follower, Erik may be inexplicably attacked by members of the Companions if visiting Jorrvaskr in Whiterun. Despite normal behavior, if made a stewardHF, Erik will charge you to travel with you, every time. The dialogue option to become a stewardHF may never appear. If made a stewardHF, the steward dialogue options may not appear. Leaving the zone for 24 in-game hours and returning may resolve this. (DB)Erik may use Talvas Fathryon's follower dialogue. This bug is fixed by version 1.0.2 of the Unofficial Dragonborn Patch. He may attack you on sight after you have liberated the Reach for the Stormcloaks. After Solitude has been conquered and thus the civil war has ended, he will revert back to his normal behavior. ?